While attending an Internet Commerce Association working group meeting at THE Domain Conference last month, I had the chance to chat with domain industry attorney Zak Muscovitch. We spent some time discussing some recent UDRP proceedings, and I thought readers might appreciate learning more about how the UDRP process works. I asked him questions about responding to a UDRP and protecting domain names from being subject to a UDRP filing. Zak has represented many domain owners in UDRP proceedings and other domain name disputes, and I think he has a very good track record. 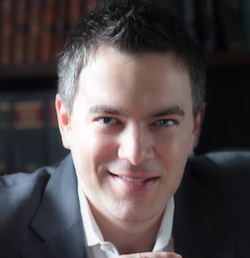 Zak’s law firm is based in Toronto, and he represents domain name owners in many jurisdictions. I understand that the ICA will be adding a UDRP resource section on its website. Many domain owners aren’t sure what to do when they receive a UDRP complaint. The ICA will be offering helpful information, and Zak is one of the main contributors. If you have follow up questions for Zak, I invite you to post them in the comment section. If you have questions that are specific to a UDRP proceeding, you should probably ask them privately. What are the most important things a domain owner should know when receiving a UDRP complaint? If the Complainant tried to employ magic, it is a good sign that the domain name owner has a very strong defense. The second thing I tend to look for when reviewing a UDRP Complaint, is luck. Napoleon was reported to have once been asked what kind of generals he wanted, and he replied that he wanted “lucky ones”. Luck is important in law as well. Sometimes a Complainant won’t hire an experienced domain name lawyer, and will prepare a Complaint that is full of holes, and makes defending against it a lot easier. Sometimes the Complainant will even pay for three panelists instead of the usual one panelist, and that is a lucky break for the domain name investor, as it saves them a lot of money. Why use a lawyer to respond to a UDRP, or can a domain owner defend themselves without a lawyer? Zak: 2016 marks my 17th year handling domain name disputes, and even with all those years of experience, I find that defending UDRP Complaints is often complex, challenging, and takes a lot of time. It is not uncommon for me to spend 40+ hours defending against a UDRP Complaint, and to me that demonstrates the level of difficulty that it often involves. Accordingly, there are likely few people who are not experienced domain name lawyers that could defend a case as well as an experience domain name lawyer. The other factor to consider, is that part of a domain dispute attorney’s job, is to determine whether a Complaint is even worth defending against. I often see domain name owners mistakenly believe that they have a valid defense. For example, the “defense” that “the domain name was available for registration”, alone is not generally a defense when confronted with a distinctive and well known trademark that pre-existed it. Accordingly, consulting a trustworthy and experienced domain name attorney regarding the likelihood of a success defense, is often a time-saving and money-saving tool. How can a domain owner reduce the risk of receiving a UDRP complaint? Zak: Aside from the obvious, i.e. conducting trademark clearance searches prior to registration in order to avoid registering an infringing domain name in the first place, I think that a lot of domain name owners take a lot of risk when using the domain name for PPC advertisements, even with “generic” domain names. For example, a domain name investor can register a domain name like OCTOPUS.COM in good faith, because it is a “generic” dictionary word. But if he or she then uses this domain name for PPC and the PPC algorithm starts showing advertisements related to, for example, surfing, the domain name owner might think that is because octopus relates to the ocean which relates to surfing. But the real reason might be that OCTOPUS is a registered trademark for surfing accessories sold by Octopus International Inc., of California, and in that case, the domain name owner will have unwittingly exposed him or herself to allegations of trademark infringement and/or cybersquatting. Is the domain owner at a disadvantage in a UDRP proceeding? Generally, I would say, “yes”. The primary reason is that the trademark owner can choose the time and place of the dispute. It can take weeks, months, or even years to prepare its Complaint, whereas the domain name registrant only has about 20 days to respond. This is a very burdensome deadline. Also, the Complainant can select which dispute resolution provider that it brings the Complaint to, and that is a feature of the UDRP which encourages “forum shopping”. One other feature of the UDRP that can put the respondent at a disadvantage, is that a respondent can be forced to pay up to USD $2,000 for the privilege of having its defense heard by three panelists, instead of one. Accordingly, by merely filing a Complaint, however meritless, a trademark owner can make the innocent registrant spend money to defend itself, thereby putting financial pressure on the registrant. Who has the right to own a domain if it is based on a common word but a company also has a trademark on that word? In terms of the UDRP, it turns on whether the domain name was registered and used in bad faith. There actually was a real case in 2011 regarding the domain name OCTOPUS.COM. There, the registrant claimed that the domain name was “generic” and she wanted to develop a website related to octopi. The Panel nevertheless found that she had registered and used the domain name in bad faith, primarily because she was a former employee of OCTOPUS, a travel agency, the trademark owner, and because she used the domain name for advertising links to the complainant’s travel industry competitors. However, someone else could have easily registered and used this domain name in good faith, if they were not related to the trademark owner and truly did use the domain name for an informational website about octopi, or at least for something not trademark infringing. Accordingly, it is the intention in registering a particular domain name, that can make all the difference between an investor and a cybersquatter. As a domain owner, if you attempt to respond yourself you are at a great disadvantage. You are likely facing a UDRP complaint drafted by an attorney with UDRP experience. The panelist is also likely to be an attorney who has spent much of his/her career representing brand owners and looks at evidence from that perspective. Many panelists also draft complaints as part of their day job, where they advocate for interpretations of the UDRP that will result in a domain transfer. When these attorneys take the role of panelists, they have an incentive to take the same aggressive positions in favor of the trademark owner that they argue for when they act as an attorney for a complainant. This is a conflict of interest that does not bother WIPO or the Forum, as they draw many of their panelists from the ranks of attorneys who also act as attorneys for complainants. As Zak says, the key to a UDRP is whether the panel thinks the domain owner registered the domain in bad faith. The domain could have been registered a decade or more ago, and yet the Panel, based on some arguments on a piece of paper, is going to look into your soul, determine your intentions, and either say your registration was in good faith or brand you a bad faith cybersquatter and take away your domain. Panelists are very creative in coming up with justifications for why a domain was registered in bad faith: such as it is not being used, it is being offered for sale, the Whois information is incorrect, it is under Whois privacy, the domain owner in one continent must surely have known about the brand owner who is a small business on a different continent, or even though the domain was registered before the brand owner existed the domain was renewed in ‘bad faith’. A domain owner facing a UDRP complaint is going into a situation where the deck is stacked against you and if the decision goes against you, you lose a potentially valuable domain name and your reputation is harmed as you are publicly branded a bad faith cybersquatter. If you want to defend yourself adequately and protect your business and your reputation, then you should engage an experienced domain attorney. Zak is one of the best. Thanks Zak and Elliot for giving some insight about what to do if faced with a UDRP complaint. Thank you for sharing this interview from Attorney Muscovitch. Moving forward, I believe only corporations, millionaires, and lawyers will be serious Domainer; because they have they resources to defend their generic or keyword digital assets. On that note, I wonder why there is not more discussion on the fact that the truest cyber-squatters in the world are corporations; who do try to conquer and monopolize the generic domain market? I think Nat’s comment about conflict of interest may be correct for some trademark attorney-panelists but not as a general proposition. If respondent appears (and sometimes even if they don’t) and the record demonstrates either a right or legitimate interest or priority there will most likely be a respondent’s verdict, and yes from TM-panelists. Zak’s correct that respondent and counsel need to understand the evidentiary requirements of the udrp. But there’s also some unfortunate decisions that would most likely have gone the other way in acpa actions. Zak’s also correct in pointing out the cost burden to respondents for 3-member panels. One of the problems for unrepresented respondents(and even when they are)there’s a failure in presenting the right narrative and marshalling the right evidence. Oh, and thanks Eliot for putting the conversation up. These are important issues. Does the UDRP enforce conflict of interest (to be seen). That is asking the panelist before accepting a case that no conflict exists and them confirming that? Panelist law firm has done previous work for the complainant. Panelist has received work in the past from the complainants law firm. Why are the feed providers not held responsible?? They are feeding the “bad” ads to the site?? And why would a trademark holder complain if an ad is shown on an exact match domain? ?? Are they not paying gargoogle to put them on relevent sites??? This is a CRAP system run by idiots IMHO.